Peppermint is highly invasive and easy to grow plant used to flavor multiple treats, from peppermint patties to candy canes. While there are many different varieties of mint, peppermint is the most commonly used for medicinal and culinary purposes. It is a natural hybrid cross between M. aquatica (water mint) and M. spicata (spearmint), native to Europe. While peppermint as it is know today was first described in the 17th century, other varieties of mint have played an important role in the customs and mythology of ancient peoples. Today, peppermint is cultivated for its essential oil, of which the US is a major supplier. 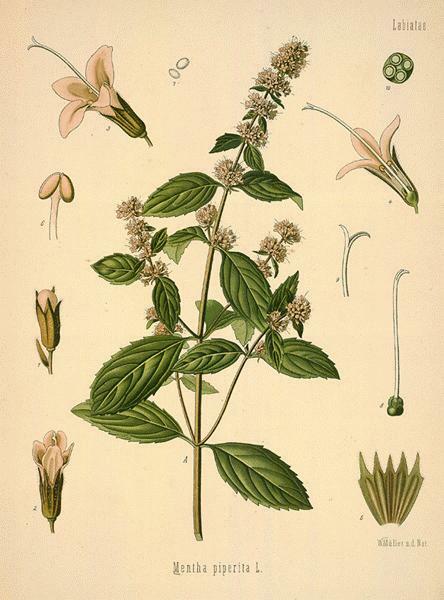 The leaves of this kind of mint are shortly but distinctly stalked, 2 inches or more in length, and 3/4 to 1 1/2 inches broad, their margins finely toothed, their surfaces smooth, both above and beneath, or only very slightly, hardly visibly, hairy on the principal veins and mid-rib on the underside. The stems, 2 to 4 feet high, are quadrangular, often purplish. The whorled clusters of little reddish-violet flowers are in the axils of the upper leaves, forming loose, interrupted spikes, and rarely bear seeds. The entire plant has a very characteristic odour, due to the volatile oil present in all its parts, which when applied to the tongue has a hot, aromatic taste at first, and afterwards produces a sensation of cold in the mouth caused by the menthol it contains. Mint is one of the easiest plants to grow…as long as you give it plenty of water and sun. You can easily grow it in the ground (if you don’t mind a mint field) or in a container (a well lined container), and enjoy mint tea all year round! Most of the time we are busy trying to just keep it tidy. The stolons of mint are some of the most aggressive in all the plant world. If you plant it in the ground, the first year you wonder what all the fuss is about. The second year you find a few stray sprouts and by the third year it is climbing in the bedroom window. Mint will grow 20 feet under weedblock and come out the other side and with no water in mid summer. Mint spreads two ways, by runners and by seed. Those sprouts that shoot up from the broadcasted seed will probably not be the same as the parent they came from. They will probably smell rank and taste worse. Plant your mint where you can control it. Don’t think just because you put it in a pot that is sufficient. Keep your eye on the pots too: mint can crack clay pots and escape into the neighboring area. Unless you want mint everywhere, grub out all those pesky runners that find their way into the soil as soon as possible. Once those runner’s roots really take hold and the other plants grow around them, that space will be mint for life. Don’t put more than one kind of mint in a pot. If you mix your different kinds of mints up in the same pot, either one mint will smother the rest or they will get so mixed up, it will be difficult to tell them apart. Mint likes full sun and lots of water. If you put your mint in the shade, it will grow floppy and the flavor will not be as strong as when you grow it in the sun. Mint is hardy to zone 5 and likes almost any garden soil. It enjoys a damp location, though, and rich soil. Mint planted outdoors should be mulched heavily to protect against frost. Mint is a perennial herb and when grown in pots needs to be divided every year. Plant your mint in a colander…it will grow out the holes in the container, and you end up with a big hanging ball of mint. Harvest mint in the morning after the dew dries. This is the time when most plants have the highest amount of essential oil. Mint can be preserved by hanging it in bundles upside down to dry. As with other herbs, store in a cool, dark place in glass containers. Peppermint has calming and numbing properties. It can help treat headaches, skin irritations, menstrual cramps, and digestive complaints. It helps relieve congestion in chest rubs and it has antibacterial and antiviral properties. Peppermint relaxes stomach muscles, improves bile flow (bile helps digest fat), and stimulates salivation. For this reason, it can be used to improve appetite, relieve cramps, and reduce conditions such as irritable bowel syndrome, nausea, or motion sickness. Peppermint can be used medicinally in tea form, as a tincture, in enteric-coated capsules (coated capsules that pass thru the stomach and into the intestine) and creams or ointments (should contain no more than 16% menthol). Tea should be prepared from dried leaves of the plant and is widely available commercially, or can be prepared from 1 tbsp of dried peppermint in 1 cup of boiling water, allowed to steep for 10-15 min. There are all sorts of ratios and such for tinctures…but for peppermint, its pretty foolproof, so don’t worry about it (I’ll cover tinctures later). Fill a jar halfway with chopped fresh peppermint, cover it with 80 proof vodka, and let it sit in a cool dark place for about 3 weeks, then strain and store in a cool dark place. Another option is to peppermint tincture can be prepared by adding 1 part peppermint oil (food grade, not essential oil) to 9 parts pure grain alcohol. Do not give peppermint to an infant or small child, because peppermint oil applied to the face of infants can cause life-threatening breathing problems. In addition, peppermint tea may cause a burning sensation in the mouth. * Tea: Steep 1 tsp. dried peppermint leaves in 1 cup boiling water for 10 minutes; strain and cool. Drink four to five times per day between meals. Peppermint tea appears to be safe even in large quantities. * Tension headaches: Using a tincture of 10% peppermint oil to 90% ethanol, lightly coat the forehead and allow the tincture to evaporate. * Itching and skin irritations: Apply menthol, the active ingredient in peppermint, in a cream or ointment form no more than three to four times per day. *Avoid ingesting peppermint if you have gastroesophageal reflux disease (GERD) or hiatal hernia as it may worsen the symptoms of heartburn and indigestion. Also, do not ingest peppermint if you have gallstones. *Pregnant or nursing mothers should not use peppermint and peppermint tea. *Peppermint oil should never be applied to the face of an infant or small child, as it may cause spasms that inhibit breathing. *Large doses of peppermint oil can be toxic. Pure menthol is poisonous and should never be taken internally. It is important not to confuse oil and tincture preparations. *Menthol or peppermint oil applied to the skin can cause a rash. * Do not use peppermint if you take cyclosporine (drug usually prescribed for recipients of organ transplants), as it can reduce the absorption of the drug. *Enteric-coated peppermint capsules may dissolve in the stomach instead of the intestines, if they are take with acid-reducing drugs, lessening its effectiveness. 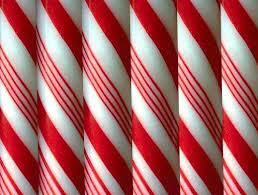 Peppermint should be taken at least 2 hours before or after an antacid such as Pepcid, Tagamet, Zantac, etc. Peppermint oil is generally a colorless liquid, with a distinctive smell and camphor-like taste. Reportedly it can be kept as long as ten years, though the oil may mellow. It blends especially well with eucalyptus, lavender, marjoram, lemon and rosemary. The chemical components of peppermint oil are menthol, menthone, 1,8-cineole, methyl acetate, methofuran, isomenthone, limonene, b-pinene, a-pinene, germacrene-d, trans-sabinene hydrate, and pulegone. Peppermint is a common additive in shampoos, lotions, soaps, lip balms, etc…because it smells and feels, and makes you feel fantastic. *Try a face mask for oily skin from 2 tablespoons of finely (or food processed)chopped mint and 2 tablespoons of ground oatmeal mixed in enough yogurt to make a paste. Apply to a clean face for 10 minutes, and rinse with warm water. *For any type of skin, add a couple drops of peppermint oil to some honey, and apply in a thin layer to the face after washing, and then rinse with warm water. * For happy feet, try adding 1-3 drops of peppermint oil to a tablespoon of any unscented lotion, or to aloe gel, add 2-5 drops of peppermint oil and 1/3 c baking powder to a basin of cool water and soak for a soak, or try making a peppermint salt scrub, to smooth away rough skin. *For a hair treatment, try warming 1/2 cup olive oil and add 2 teaspoons ground lavender flowers, and two tablespoons of ground peppermint. Massage into scalp over damp hair. Cover hair with shower cap to keep heat in. Sit in the sun, if possible, for 20-25 minutes, then wash hair. Peppermint is commonly used in healing and cleansing/purification spells. Other uses include consecration, dreams, healing, love/passion, happiness, abundance/prosperity, protection, psychic development, mental clarity, purification, release, divination, renewal, to increase positive energy and travel. Peppermint in oil form is widely used in a variety of flavorings, however the herb itself is also used in its whole form in a variety of dishes from various cultures. *Try chopping the leaves finely and make mint ice cubes or use it to make mint jelly for use with lamb dishes. *Dry or freeze individual leaves or infuse with vinegar or oil to make salad dressings in the winter months. Place tea bag in boiling water and steep for 15 minutes. Discard tea bag and allow liquid to cool. Add witch hazel and lemon juice and store in glass container in the refridgerator. Apply daily after cleansing face. This toner is best on normal or slightly oily skin. It will remove any residue of dirt or make-up and close pores. Mix all ingredients together. Pour into jars. And head to the bath! Place the watermelon, peppermint leaves, honey, and ice cubes into a blender. Cover, and puree until smooth. Serve immediately. Crush the oreos in a ziplock bag with a rolling pin if needed to make about 1 c.
Combine crumbs and butter; press onto bottom of 9″ springform pan. Bake at 350 degrees for 10 minutes. Cool. Soften gelatin in cold water; stir over low heat until dissolved. Combine cream cheese and sugar, mixing on electric mixer until well blended. Gradually add gelatin, milk and peppermint candy, mixing until blended; chill until slightly thickened. Fold in whipped cream and chocolate. Pour over crust; chill until firm. Garnish with additional whipped cream and peppermint candy, if desired. Boil sugar and water 1 minute. Cool completely and add peppermint flavoring and Everclear. 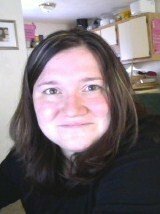 I have many different kinds of mint and would like to know of the best way to make the tincture for making soaps and lotions from the raw plant material, is it better to dry it first and then put it into alcohol? For the most part, fresh herbs are ideal as they are thought to produce more potent tinctures (also infusions and decoctions). There are of exceptions–I personally prefer to infuse oils only with dried herbs (although fresh herbs can also be carefully infused in oil) to prevent the oil from going rancid, and some herbs may tincture or infuse better when dried. I would personally use an infused herb into an oil in combination with either distilled water or an infused distilled water to make an emulsified lotion or creme. However…you can make a liquid lotion with tincture, hydrosol and glycerin…I haven’t tried this yet, but a good basic info/recipe can be found here.